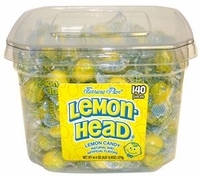 Everyone's favorite lemonheads candy are also available in an extra large size. A giant lemon head with a sour lemon flavor that is sure to make you pucker up and have your tongue begging for more!!!! Each giant lemonhead is approx. 3/4 of a inch, you get 140 individually wrapped giant lemon head jawbreakers per jar. Did you know that Ferrara Pan Company makes 4,800 Giant Lemonheads per minute and produces approximately 240,000 per hour? Which means Ferrara Pan makes approximately 1,920,000 lemonhead jawbreakers per day.